I appreciate if you add little description about the time window according to spacial resolution and how it affect the model forecast. A good lesson for basic understanding of data assimilation components and analyses tools. 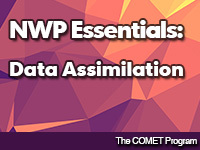 Very good, although NWP essentials are not labeled as a series, or numbered I would advised one to do each one at a time starting with the easiest and ending with the hardest. Great concept map to help build an understanding of the process and remember the main points easily!